In September 1914, WWI had only just begun. Europe was plunged headlong into the greatest conflict yet seen, but a victory for either side was very much up in the air. Most of the fighting took place in France and the Low Countries, but out in the Atlantic Ocean, two former civilian steamships, fitted out for war, fought to the death. 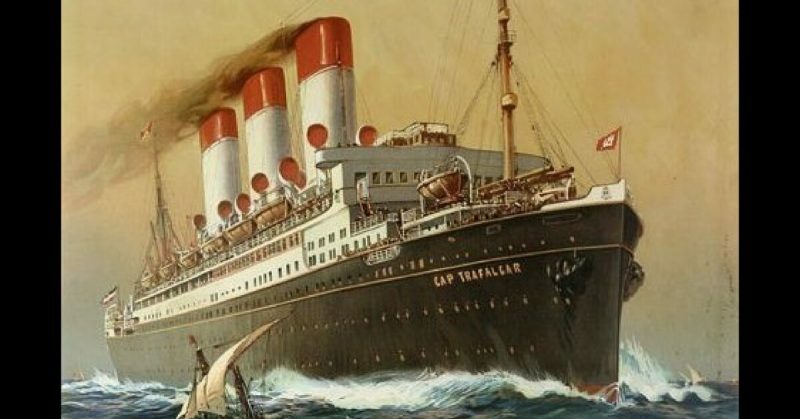 SMS Cap Trafalgar, an ocean liner launched in 1913, had arrived in South America only a few months before the war broke out. She was 613 feet long, and 72 wide, the largest commercial ship in South American waters at the time. In addition to her impressive size, she was one of the most luxurious ships in service. Her 1st class halls and stairwells were full of beautiful gold filigree, and her staterooms were furnished in the highest fashion of the period. Her upper decks included a swimming pool and even a cafe in a greenhouse. She was the epitome of pomp, elegance, and Germanic engineering but when war was declared, her career among the socialites and wealthy of the world ended. She met with the German gunboat, SMS Eber, in Montevideo on August 18, 1914. 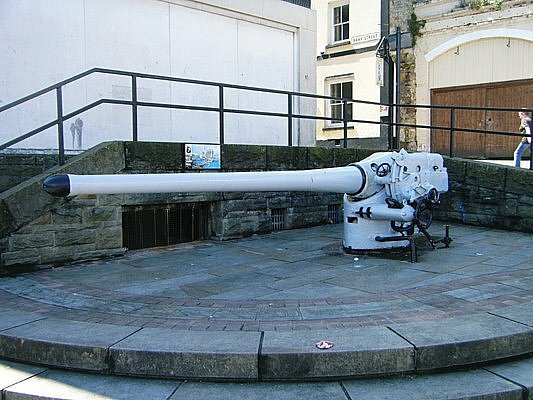 She was given an armament of two, 4.1 naval guns, and six, 1 pounder pom-pom auto cannons (named for the sound they made while firing). Her high-class passengers were replaced with a seasoned and experienced naval crew. They knew those waters, knew their weapons and were ready to wreak havoc on enemy shipping in the region. The Cap Trafalgar was not the only converted cruiser around. 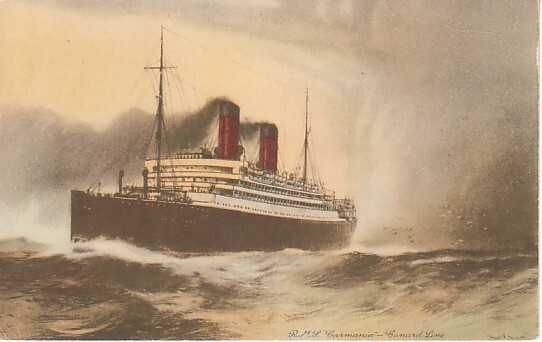 In Bermuda, a new ship had just arrived; the RMS Carmania. She was another ocean liner, launched in 1905. Despite being almost a decade older, she was 40 feet longer, cruised a knot faster, and was armed with eight, 4.7-inch quick firing cannons. While the Cap Trafalgar was intending to hunt British shipping, the Carmania was looking for merchant raiders. On September 14, 1914, their paths crossed. The Cap Trafalgar had arrived the day before at Trindade Island, Brazil, where the Imperial German Navy had established a secret supply base. There she met a pair of collier ships, and they anchored just offshore. The three ships sat overnight, refilling the merchant raider’s coal bunkers. She had just completed her first, but unsuccessful mission, and was preparing to go out again. Her crew wanted a chance to prove their worth and succeed in action. Little did those men know that another ship was bearing down on them. The Carmania knew roughly where the German ship was operating and had determined Trindade Island was the most likely place for a base. 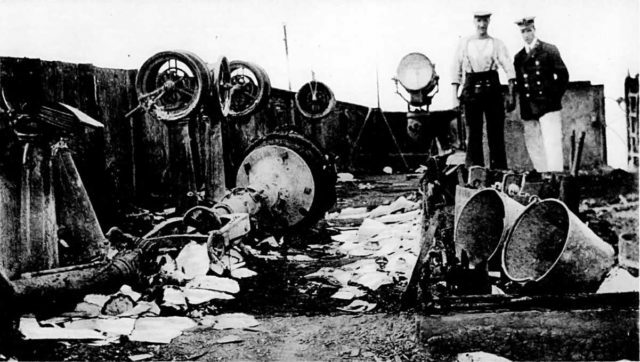 She approached the small Island around 1100 on September 14, 1914. On the horizon, she could just see a hint of smoke. The Cap Trafalgar had finished loading coal and was building up a head of steam to begin her next mission. Around noon the Carmania could see the other ship clearly. The Cap Trafalgar turned about and steamed away from the Carmania. At first, the Carmania’s captain must have been confused; her prey was painted almost identically to her. There was no reason for a fellow British ship to flee, so she pursued. After a short chase, the Cap Trafalgar turned to starboard and began bearing down on the Carmania. At 8,500 yards, the Carmania fired the first shot. A shell whizzed towards the German ship, splashing in the ocean nearby. 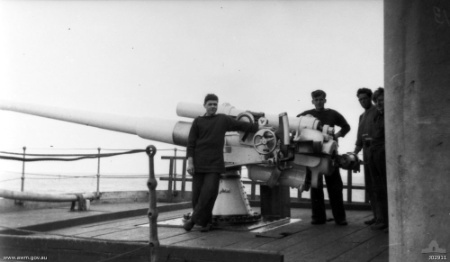 The Cap Trafalgar responded almost immediately with her starboard main gun, and a 56-pound piece of steel flew out at 2,300 feet/second. A plume of water shot up next to the Carmania. Both ships then opened fire. The Carmania was able to bring 4 cannons to bear, while the Cap Trafalgar had 1 cannon and 3 autocannons. It was her autocannons, essentially heavy machine guns, which proved the most effective. 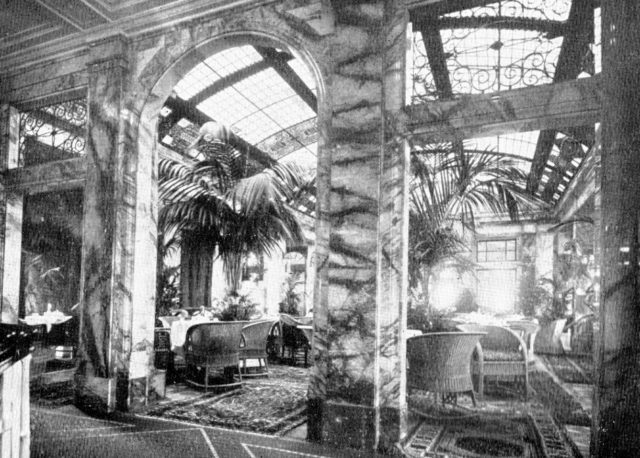 They raked the Carmania’s upper decks fore and aft, sending shrapnel, marble, and splinters flying down the corridors of the luxury liner. The Carmania scored a hit in the Cap Trafalgar’s bow starting a fire and causing her to list to starboard. Then the Carmania’s forward cabin, just beneath the main bridge, caught fire, and a shell destroyed her fire mains, so there was no way to extinguish the rapidly growing blaze. The bridge was abandoned, and the Captain and his officers moved aft, fleeing the flames. Both ships continued the fight, their once majestic interiors filling with wounded crew members, smoke, and debris. The Cap Trafalgar continued to fire onto Carmania’s decks, hoping to destroy her guns. The Carmania, changed her aim to the Cap Trafalgar’s water line, blasting hole after hole in the ship’s side. As the battle progressed, the Cap Trafalgar took on water and began to list heavily. 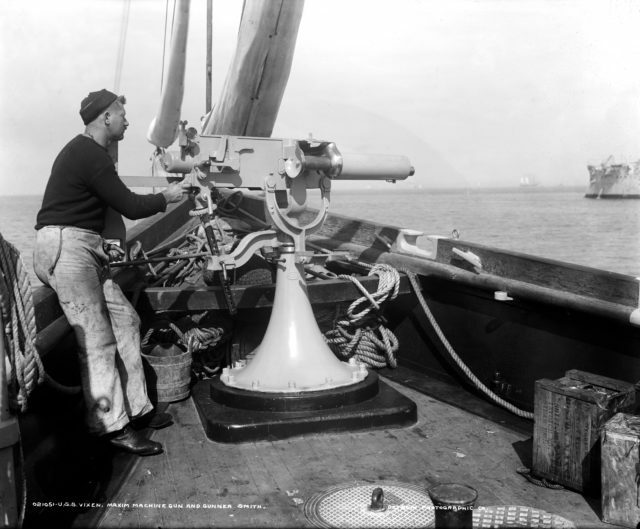 Her crew continued firing their machine guns, making sure they defended the pride of their captain, their ship, and Germany. As she began sinking she sent out distress messages to all vessels in the area. German merchants sat on the horizon, waiting for the outcome of the battle. Finally, the Cap Trafalgar swung to starboard. Her crew filled the lifeboats, as others jumped into the debris-filled ocean. Some were trapped within the ship and had little chance to escape. The Carmania was barely afloat. She listed severely as fires burned and the communication and navigation equipment on her bridge were almost destroyed. She turned away and sped south, hoping to rendezvous with a British cruiser in the area. By the time she was rescued on the 15th, she was hardly seaworthy and most likely would have sunk if at sea for more than another day or two. 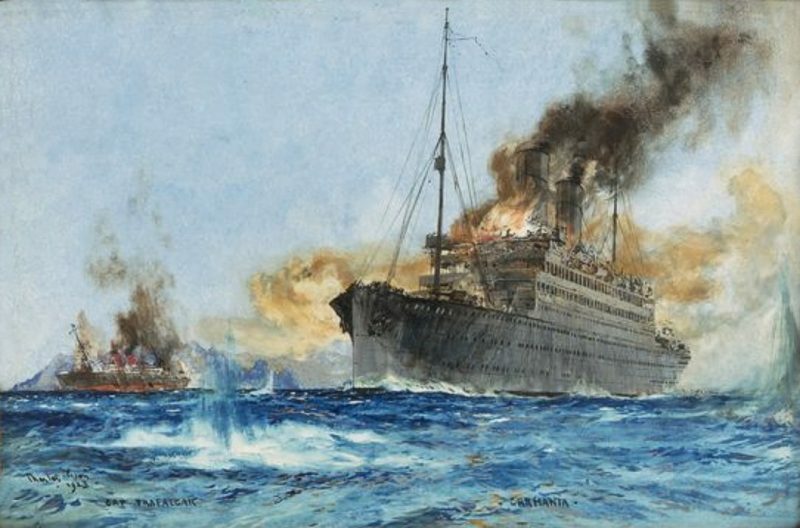 The battle had lasted less than 2 hours, cost the lives of approximately 60 men, and one of the finest ocean liners of the period. Despite the shortness of the battle, or the light casualty count (60 out of around 600 in total), it had been an incredibly fierce conflict. The battle foreshadowed the coming naval war. It was no longer fought as pitched battles between admirals but as an array of small desperate and intense actions around the world. The Great War had begun.